Grab your halter tops and flares, and feather your hair like Farrah, because it's time to get on the love train, do the hustle down to boogie wonderland, where they'll play that funky music and you don't stop 'til you get enough because you should be dancing to disco inferno when DISCO-A-GO-GO takes over The Night Cat, Saturday Feb 9! 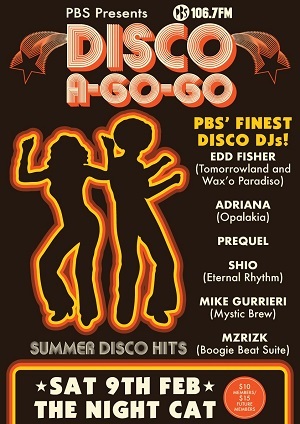 They'll be busting out all your favourite disco jams to keep you on the dance floor til the break of dawn! (Actually... 3am when the club closes) See you there, Giorgio! $10 for PBS members $15 for future members. Disco A Go Go at The Night Cat. This is a Bandmates Victoria friendly event. The Night Cat is a wheelchair accessible venue. An opportunity for sober people to recharge and re-energise at Coburg Lake while dancing to DJ Lucky Socks spinning 80s, 90s, and house grooves.